Shiv Sena has released a series of posters attacking the BJP. Sena is known for sharp, blistering attacks no rivals, but these posters mock BJP and PM Narendra Modi. Sena shares power in Maharashtra with the BJP. Still, it comes up with posters that target BJP for failing to take care of farmers. 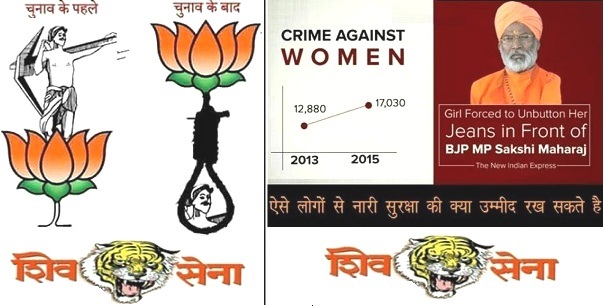 The first poster is about BJP's election promises before it won Lok sabha election and the farmers' suicides, now. The second targets Sakshi Maharaj, the BJP MP, for forcing a girl to unbutton her jeans. There are many more posters. Besides, there are Rupesh Patil's caricatures that term BJP government as 'suit-boot and loot ki sarkar' to calling Modi a 'traitor'. But what's the reason behind the Sena's sharp attack? It's for survival. In the Assembly election, Sena didn't perform too well and BJP's vote share rose dramatically in Maharashtra. This alarmed the Shiv Sena and though it later joined the BJP to form a government, ever since it has been attacking the BJP off and on. 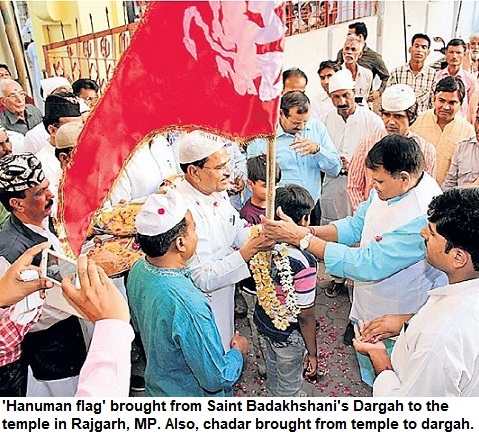 The Sena is worried that its bastion, would fall, as BJP and Shiv Sena have the same voter. Besides, the most crucial--Brihanmumbai Municipal Corporation (BMC) election is slated next year. If Shiv Sena fails to win Mumbai corporation [BMC], it will be a big jolt for Sena. BMC has a huge budget--more than many state governments in India, and its the Shiv Sena's muscle power along with financial strength that it derives from the here, that helps it stay afloat in Maharashtra politics. Hence, Shiv Sena can't afford to lose Mumbai. It can't allow itself to be a junior partner and cede even Mumbai, because, that would be the end of the Sena as a regional power. Once, it was big brother in Maharashtra, today BJP calls shots in the alliance. No wonder, the Sena is desperate, attacking the BJP. The situation is such that 'snake', 'cat', 'dog' are being used by them to describe each other. The BMC election will take place in February 2017. The slugfest may turn even more bitter in coming months.